Make a kaleidoscope, 25cm long with a removable cover lid for its trinkets chamber. 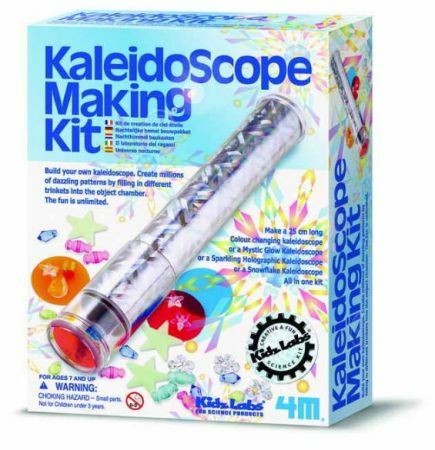 The different trinkets sets provided enable one to make a Color Changing Kaleidoscope, a Mystic Glow Kaleidoscope, a Sparkling Holographic Kaleidoscope and a Snowflake Kaleidoscope. Contents: paper cone, holographic foil, trinkets chamber with removable cover, 3 salety mirrors, 4 bags of different trinkets (glow stars, colour beads, sequins, crystal clear beads), 3 color filters, eye piece cover, card stripe, double adhesive tapes and detail instructions with fun facts.